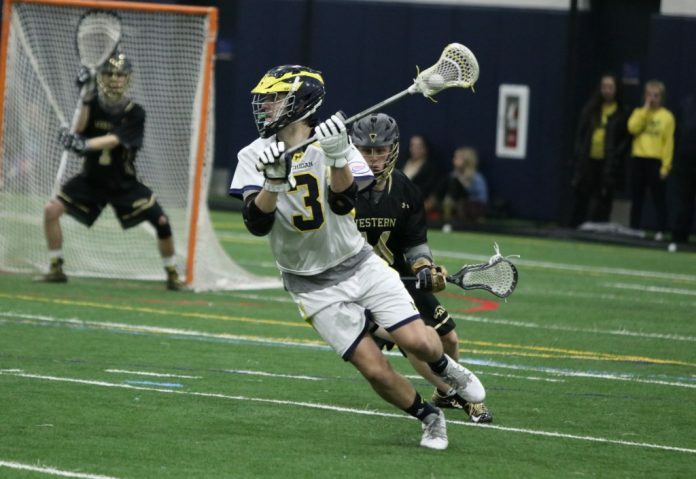 The UM-Dearborn men’s lacrosse team had a busy weekend as they faced two quality opponents at the Detroit Country Day field house on Saturday and Sunday. They first faced off against the Benedictine College Ravens. The game was fast paced and the scoring was plentiful as the Wolverines got an early goal from sophomore midfielder Micah Rinke. The goal was assisted by senior attack Matthew Rosteck. The Wolverines also had goals by sophomore attack Devon Callaghan (2), senior midfielder Hannibal Roda, and Matthew Rosteck. Rosteck had an assist on one of the Callaghan goals and Roda assisted on the Rosteck goal. The Ravens answered quickly with a goal from Brendan Boh. The score after the first quarter was 5-1 Wolverines. The Ravens began to push on defense during the second quarter and this helped them secure three goals in the quarter from Peter Girard, Ryan Heinser, and Ethan Novacek. The Wolverines got a late goal from Callaghan making the score 6-4 Wolverines going into halftime. The third quarter was heavy scoring as both teams scored three goals apiece making the score 9-7 still in the Wolverines favor. Roda scored an early goal in the third followed by two Rosteck goals late in the quarter. The Ravens had goals from Peter Girard (2), and Joseph Doyle. With shouts for “Communication!” by the Ravens’ coach, the third quarter ended after fierce plays by both teams. The fourth quarter started and remained close as freshman long-stick middle Chad Reynolds scored for the Wolverines. The Wolverines and the Ravens seemed to score back to back before the Ravens seemed to pull ahead with a series of assists. The Ravens pulled ahead 11-12. However, the Wolverines were able to tie things up (14-14) with 15 seconds left on the clock. The game went into overtime with the Wolverines claiming a 15-14 victory with a strong play by Roda, assisted by Rosteck. win,” said assistant coach Mike Wagner. The Wolverines also saw action on Sunday night as they took on the Montreat College Cavaliers. The Cavaliers scored first in the game and went on to score four more goals in the first quarter. The Wolverines lone goal in the first quarter came from Roda assisted by Rosteck on a power play. Both teams would score three goals in the second quarter making the score 8-4 in favor of the Cavaliers. The Wolverines had goals by Callaghan, freshman Colin DeWitt, and freshman Adam Ranck. The third quarter saw three more goals by the Cavaliers and two more from the Wolverines making it 11-6 Cavaliers. The Wolverines had goals from Rosteck and DeWitt. The Cavaliers pulled away in the fourth quarter scoring five more goals with the Wolverines getting three more. The final score was 16-9 giving the Cavaliers the win. The Wolverines scorers were Ranck, Callaghan, and Rosteck. This gives the Wolverines a 3-2 record early in the season. The Wolverines won the shot battle with 43-39 but the Cavaliers won the ground balls (50-29) and face offs battle (22-6). The Wolverines will next face the No. 10 University of St. Mary (Kansas) on Tuesday night at 8:30 p.m. at the Detroit Country Day fieldhouse. 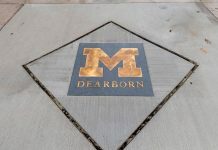 Stay with the Michigan Journal for all UM-Dearborn athletics news and scores throughout the year.